“I have no perfume memories,” says Arielle Weinberg, blog mistress of The Scents of Self and owner of the brand new niche perfume shop, Arielle Shoshana, in suburban Washington, D.C. Ari’s father lost his sense of smell in a car accident before she was born, and her mother didn’t wear fragrance. So, what got her interested in perfume? Mascara. When Ari was 15 years old (she’s 24 now), she was looking up mascara reviews and stumbled upon Makeup Alley, which led her to the Penny Pencil’s poetic reviews. Besides mascara, Penny Pencil reviewed perfume. Ari was at first intrigued, then hooked. In D.C., where Ari lived, she didn’t have much access to niche fragrances, so she dived into the Guerlains and Bond No. 9s. For a few solid years, she wore Bond No. 9 New Haarlem, and she still loves Guerlain L’Heure Bleue. Then, as a freshman in college, she started The Scents of Self. “I was a depressed chemical engineering major,” she said, and she wanted to immerse herself in something that actually engrossed her. In college, she shifted her major first to biology, then to natural sciences, but she still wasn’t satisfied that she’d found her calling. However, her love of perfume never flagged. Armed with a fresh B.S. in natural sciences, she moved to New York City with the intention of becoming a perfumer. As she made the rounds of the perfume houses, she worked at MiN and Oswald perfume boutiques, learning about niche perfume brands and the quirks of today's perfume shopper. It didn’t take long before she realized that she didn’t want to be a nose. She wanted to share perfume with others. So, Arielle returned to Washington, D.C., and took a job selling perfume at Nordstrom while she worked with her family to open Arielle Shoshana perfume boutique. The boutique launched just over a week ago. So far, Ari says a lot of her customers have asked for “clean” fragrances, and Francis Kurkdjian Aqua Universalis has been flying out the door. As far as her own perfume loves go, Ari says, “I have a sweet tooth.” She adores oriental and gourmand fragrances. Her favorites right now are Idole de Lubin and the “absolutely beautiful, beautiful” L’Artisan Parfumeur Safran Troublant, the only bottle for which she has a back-up. Her latest purchase was Chanel Misia, although straight florals are generally a challenge for her. Ari’s budget means that she limits her personal perfume acquisitions — although these days she gets to sample from the testers in her boutique — but after a long pause to consider, she said she’d love her next bottle to be Serge Lutens De Profundis. No word yet on what Zelda thinks of that. It’s a very cool story about your long trip to becoming a niche shop owner. I think that would be the most amazing experience. Best wishes on your shop! Your sweet tooth collection makes me want some dessert pronto! It’s kind of a relaxing game! What a great article, hope this will become a start to some new series. 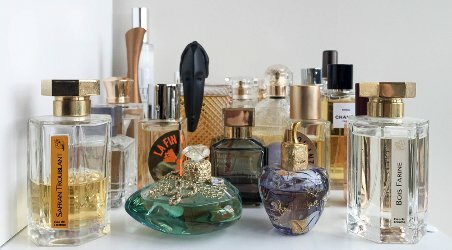 I was following Ari while she was blogging and now am happy to learn what her fragrance wardrobe consists of. And I just love that stair-shelf! Looks great. I have a bit different taste than Ari but Safran Troublant we have in common. It is a series! 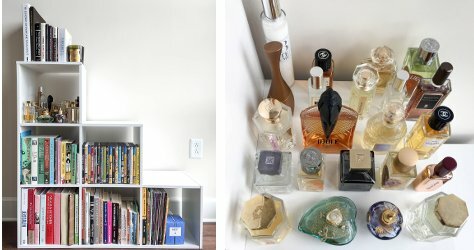 A new one, but we have two other Perfume Cabinet posts two (the links are at the end of the post). I’m glad you like the concept. They’re so much fun to write. Still haven’t tried Saffron Troublant, must remedy that! Oh, it’s a lovely one! Good luck with the business adventure to Ari and thanks for the series to Angela. Isn’t it amazing? I think the only thing I’d accomplished by age 24 was learning to drive stick shift. Please rest assured that this is not the usual state of affairs for apartment messiness- the surrounding area received a very thorough cleaning and vacuuming before these pictures. These are the darkest floors I’ve ever had, and they show white cat hair like nobody’s business! What a great collection! And I agree with comments above – an amazing feat at only 24. Can I ask what that tall bottle right at the back is, behind the Kenzo? The one with the white plumage and the silver crown? Yes, it’s CBIHP Burning Leaves! I got it for a great price when Henri Bendel axed their wonderful fragrance department (RIP). Ooh, will you fill us in on some of the others? Which MFKs are those? And I see Misia but is there another Chanel in the back row? My pleasure! The MFKs are Oud (original) and Aqua Universalis. The Chanel in the back (good eye!) is a splash bottle of No. 5 EDC. The Serge is also pretty hard to read- that’s Santal Majascule, yum. What a thrill to see my perfume cubbies up there! Thank you so much, Angela and Robin! You’re welcome! Thank you for being willing to participate. Nice set-up! I have been watching all sorts of Tiny House shows where singles and couples and some families, with or without pets, are downsizing or looking for a vacation home but did not want to spend a lot or looking for mobile alternatives to fit a nomad lifestyle or simply had a budget that would only allow a tiny house ( < 400 sq. ft.). The stair shelf reminds me of the space-saving functional build-ins for tiny houses! You wouldn’t know it by looking at my disorganized house, but I could go wild at Storables. It’s fun to at least think about how to store things well. I get so excited when one of these posts appears! Thanks for posting and to Ari for sharing her collection. Best of luck with your new shop! I just subscribed to Ari’s blog this past weekend! Her own niche store at 24….she is my shero! Lol! This might be a dumb question, but how can we access her store online? There’s a link to the store in the post. The store is called Arielle Shoshana. I love this new series! Thanks! I’ve been following Ari since I first discovered her blog 4-5 years ago which makes it especially fun to see her collection. Too bad the day adorable Zelda isn’t sitting atop the shelf! Congratulations on the store, Ari. I hope to meet you some day. Zelda sounds like a bit of a diva! Having two cats myself, though, I get it. I assure you I tried VERY hard to get a picture of Zelda on the shelf. I put treats on there, physically plopped her on top of it- she scrambled off the second I reached for my phone! I love this series. Whether it’s my love of perfume and perfume bottles, or just nosiness, I don’t know. Probably both. Congratulations on opening your boutique, Ari! I’m so glad you like the series! I admit to being nosy, too. I always wanted to open a perfume shop but was a single mom raising three boys and working full time. Plus I never had the start-up money. However, I now have enough perfumes in my collection that I could open a perfume thrift shop, but wouldn’t want to part with 90% of them. So it sounds like you almost live in your own perfume shop, but you never have to deal with customers! Perfect, really. What a stunning display. I wish *anything* in my house looked that deliberate and orderly. I’m not the least bit surprised, though; the aesthetics of Arielle Shoshona are equally lovely. I know what you mean about envying the collection’s spare tidiness! It’s lovely.